Globalisation can be summed up by the term ‘world trade’. People are now familiar with products that are made by countries, other than their own. Without globalisation, this would not have been possible. 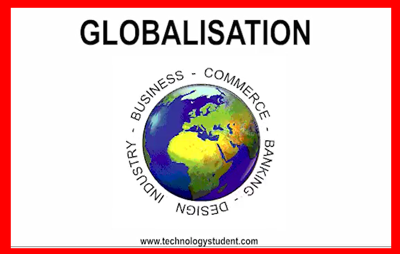 Globalisation means that there is free movement of products, services and capital, across the borders of the world, helping the world economy to grow. The worlds modern transport infrastructure, now means that the flow of labour, especially skilled labour is relatively quick. This is another feature of globalisation. An example of this approach can be seen in the car manufacturing industry. A manufacturer may have it’s headquarters in a single country, with most or all of the design work being carried out in the same country. However, various manufacturers from around the world, may supply the various standard and specialised parts. The manufacturing of a particular model of vehicle, may take place in car plants in Europe, Asia and South America. This is an international network of factories, working together to manufacture a product. Multi-national corporations tend to work globally and have embraced globalisation, taking advantage of interest rates, currency rates, cheap labour and labour skills across the world. However, globalisation is not necessarily the preserve of large companies, as small businesses often take advantage of good international communications, to expand. For instance, it is possible for a small design company to have their designs manufactured abroad (see Remote Manufacture). The financial institutions of the world (banks, venture capital companies, investors), have been at the forefront of globalisation for decades. For example, Investment Banks deal with buying and selling company shares and large money transfers. This is usually completed electronically and can involve the transfer of millions / billions from one country to another, at anytime of the day or night and at the press of a key on a keyboard. The introduction of container ships, carrying shipping containers, led the way for globalisation of trade. Large amounts of manufactured goods could be loaded on to ships, transported and unloaded with relative ease and relatively cheaply. An efficient international distribution system is another feature of globalisation. Large numbers of people taken out of poverty, as the world economy grows. The flow of ideas and education. Products more widely available, to poorer regions of the world. Flow of skills from one region of the world to another, filling skill gaps. Manufacturing industry chasing increased profits, moves to the source of cheap labour, leaving unemployment behind (e.g. the UK in the 1980s and 90s, hundreds of thousands of manufacturing jobs were lost to countries such as China). This can cause social unrest. Increased economic well being leads to increased pollution and environmental damage, as more and more natural resources are used, as industrial and agricultural production increases to satisfy the needs of populations. Some companies move their manufacturing to countries where labour is cheap. Unfortunately, this often means health and safety is ignored or is less important, compromising the safety of workers. Often working conditions are also difficult, such as longer working hours and less holidays.